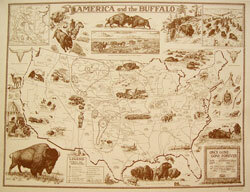 The “America & the Bu alo” map is 19 “x 25” and features the historic migration of the American buffalo. This comprehensive map shows the distribution and location of the buffalo herds from 1500 to 1899. Beautifully illustrated with an Antique appearance.